The concept of retirement villages has caught on in a big way in the Sunshine State. These are communities where resort-style amenities make it easy for older adults to maintain an active lifestyle with needed services located nearby. However, with housing costs on the rise, many retirees from Michigan and elsewhere are wondering whether they’ll be able to relocate to the Sunbelt and afford the kind of lifestyle they’ve been dreaming of. Fortunately, Blair Group has found a way to provide active adults 55 and older with a lifestyle that rivals the swankiest retirement villages but at a much lower cost. 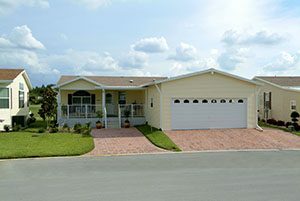 We operate five gated communities of high-quality manufactured homes in Central Florida, each with its own set of resort-style amenities and distinctive charm. When you purchase a manufactured home in one of our communities and pay a low monthly home site lease fee, you’ll enjoy daily access to amenities such as a swimming pool, fitness center, and banquet hall, as well as facilities for indoor and outdoor games. Plus, all of our communities are conveniently located near health care clinics, eateries, shopping centers, houses of worship, and all the exciting sightseeing opportunities that Florida has to offer. Which Blair Community Is Right for You? Plenty of former Michigan residents have discovered the secret to enjoying an active retirement on a budget at our communities. Which one appeals to you? Lake Griffin Harbor – This waterfront retirement community is a boater’s dream located near The Villages. StrawBerry Ridge – There’s never a dull moment at this bustling community located just outside Tampa. Cypress Lakes – If you’d like to play golf and visit a theme park all in one day, this community in Lakeland is the one for you. Hyde Park – Bring your golf cart and use it to travel daily to the charming Winter Garden downtown area. Bear Creek – Daytona Beach will be your playground when you retire to this coastal community. If you’re in the market for the kind of active lifestyle made possible by retirement villages, but you’d like to stretch your retirement savings to the max, contact Blair Group today. We’ll be happy to tell you more about our 55+ communities.